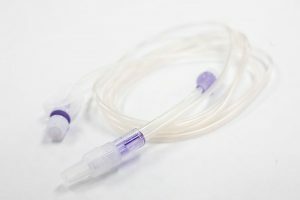 Anaesthetic Medical Systems (AMS) is a UK-based company specialising in the design and development of total intravenous anaesthesia sets. When problems arose with their offshore supplier, AMS approached Meridian Medical about moving the contract manufacturing of their range of line sets to a British company with an established reputation for quality. The search for a new contract medical devices manufacturer began after AMS started to see a decline in the quality of the devices produced by their original supplier, and a resulting high number of complaints from AMS customers. Additionally, the European supplier was not sufficiently reactive to meet spikes in demand and lead times for delivery were becoming longer and longer. Meridian Medical’s brief was to exactly replicate the AMS Sterile A Set range with identical materials and specifications, and for AMS to be able to keep the price of these low margin devices the same. With a drawing and samples for each of the products in the range, the Meridian Medical technical team went to work, using their extensive knowledge and experience to source all the original componentry. The only component that required a new mould tool was the AMS low-mix male luer connector. 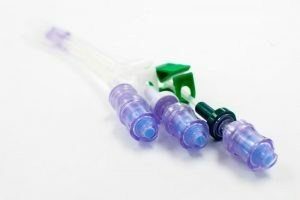 The Meridian Medical in-house tooling team designed a single mould tool, which featured new parts to produce the six varieties of connector required. This reduced lead time and produced tooling that was as cost effective as possible. Once the sets had been redesigned, the development team went on to arrange all the new validation documentation, such as shelf-life studies, production validation reports, leak and block testing programmes, and adoption of the sets into our mixed load Ethylene oxide cycle. Meridian Medical was able to directly replicate the entire range of devices and enable AMS to quickly and cost effectively transfer the manufacture of their medical devices from overseas to a local British manufacturing company. The team at AMS now have a trusted UK contract manufacturer of medical devices and have seen a dramatic decrease in product complaints. As a result they have built a reputation as a leading supplier of TIVA A sets, and safe sets. AMS have since developed a number of new sets with Meridian Medical, including multiple lengths of bonded line sets, as well as a range of needle-free safe sets. In working with Meridian, AMS can now be confident that all customer expectations have been met by using a supplier which has enabled significant growth in sales across UK and global markets. To see the full range of line sets available from AMS visit their website.